A 25th wedding anniversary is celebrated by silver in both the traditional and modern version of gift giving. This is one of the big celebrations, so Piglette has taken great care to hunt out some absolutely perfect silver anniversary gifts online which combine quality and great value for money. Simply click on the photos below for more information and prices. Worldwide delivery is available on some of the presents where indicated. Featuring a genuine classic Morgan Silver Dollar (Minted 1878 to 1921) at its heart, this innovative coin pocket watch doubles as a unique desk clock by unfolding the case back. The proud American Eagle resides on this elegant piece. The United States Mint have awarded Coinwatch the first contract to manufacture its own exclusive range of timepieces. These watches bear the "Mint Time" logo, a brand created to market their coin time pieces. Your silver dollar has been restored to its original finish by careful diamond blasting, and the watch face is protected by a mineral Crystal glass to resist scratching. Each silver dollar watch is water resistant with a quality Swiss precision quartz movement, and comes complete with an elegant gift box and 2 year guarantee. Made by Parker, these pens are crafted out of Sterling Silver. The word "fougere" translates to "feather" in English, which is what the engraving is stylized after. Available in three modes: Fountain Pen, Roller Ball and Ballpoint. The nib of this Sonnet Sterling Silver Fougere Ballpoint is 2-toned, solid 18kt gold! 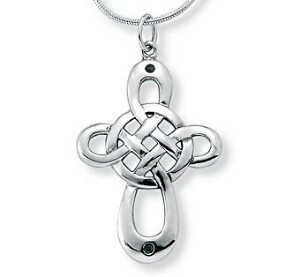 Celtic art is known for its elaborate patterns of interwoven curves and spirals. Scrollwork in Celtic manuscripts such as the Lindisfarne Gospels (approximately 700 AD) and the Book of Kells (around 800 AD) serve as inspiration for lovely designs like the one featured on this Sterling Silver Celtic Cross Pendant and chain. Distinctive in design, and crafted with care, this sterling silver Celtic cross pendant and 18" chain will elevate faith to a new level. This shiny personalized sterling silver heart chain bracelet will let your loved one carry your heart with them wherever they go. You can order it engraved with either your own initial or your partner's initial, whichever you feel is more romantic! International shipping and delivery is available on this delightful present. This beautiful twisted sterling silver bangle is generally worn by ladies who want to look absolutely marvelous, whether dressed up or luxuriously casual. It will add a casual elegance to any outfit, and its design makes it a modern classic. The twist pattern of this gleaming sterling silver bangle bracelet gives it an extra special aspect when compared to a plain circular bangle. Marcasite was used in jewelry by the ancient Greeks and more recently throughout Europe in the 19th century for women's fashion. The stones are actually iron pyrites that here create a dramatic shimmer on this sterling silver band fashioned in an intricate filigree design. 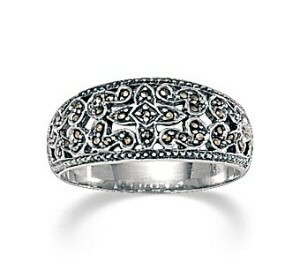 This elegant Silver and Marcasite Ring is suitable for either men or women. Marcasite jewelry is featured in the Victoria and Albert Museum in London. One of our favorite silver anniversary gifts, this very special Ladies Sterling Silver Celtic Knot Watch will bring the history of the ancient celts into your home. Celtic knotwork generally became prevalent in the later stages of celtic culture. The patterns of knots are thought to have been influenced by early christian art, particularly manuscripts. Your watch features a one-year warranty, sterling case, stainless steel back, sterling tips and findings and genuine Japanese quartz movement. This stylish Personalized Sterling Silver ID Bracelet is 8" in length. You can specify a name of up to 10 letters. It makes an ideal silver anniversary gift for either men or women. This lovely identity bracelet has a figaro link design and a lobster claw clasp. Please bookmark Piglette for a wide selection of great gift ideas to buy online including rings, necklaces and flowers at prices you'll love for anniversaries and all occasions.